What Causes Free Chlorine to Be Low in a Saltwater Pool? Instead of adding chlorine to sanitize a saltwater pool, you add salt, and then a chlorine generator converts it to chlorine. When the free chlorine level is low, that usually means it's time to add more salt, but it may mean a couple of other things as well. For instance, low chlorine readings can indicate that you need to increase the chlorinator output or run it more frequently. Continued low readings when salt levels and chlorinator runtime are adequate could mean that the pump isn't circulating water properly or that the generator cells are coated with scale or simply worn out. You can eliminate adverse effects of low chlorine--including chlorine odors, cloudy water and algae growth--by shocking the pool. Saltwater has a reputation for being easy on the skin. Whether your chlorinator is designed to automatically disperse salt or you add the salt to the pool yourself, it's important to maintain the salt concentration within the range recommended by by the manufacturer. This can be anywhere between 2,700 and 4,500 parts per million, but for most chlorinators, 3,200 ppm is ideal. Most chlorine generators have a salt sensor and will flash a warning when the salt concentration is too low. This sensor can fail for several reasons, however, so it's best to test the salt concentration in the water yourself when you're checking other chemical levels. Run the circulating pump whenever you add salt directly to the pool to ensure that it disperses completely. It helps to manually stir the water and to brush salt off the bottom when it settles there. When you test the salt concentration in the pool--which should be at least once a week--you should also test the pH. If it's above the ideal range of 7.2 to 7.8, chlorine levels are likely to remain low, even if the chlorinator is working overtime. The effectiveness of chlorine decreases dramatically with rising pH. This is because the sanitizing compound, hypochlorous acid (HOCl), quickly dissociates in alkaline water. If the pH is above 7.8, lower it with muriatic acid or sodium bisulfate (dry acid). Total alkalinity is a measure of the ability of the water to maintain a stable pH, and if it's too high, the pH is likely to rise. The ideal TA level is between 60 and 120 ppm--if it's higher, bring it down with the same chemicals you use to lower pH. It's also important to maintain the cyanuric acid level between 70 and 80 ppm in an outdoor saltwater pool, which is higher than recommended for a conventional outdoor pool. 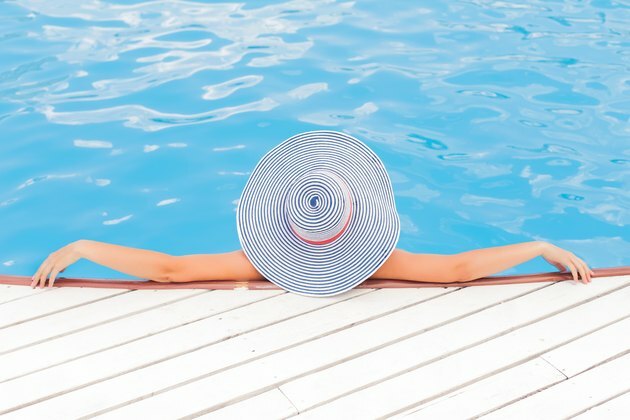 Cyanuric acid isn't as important for indoor pools, because it's a stabilizer that protects chlorine from the the degrading effects of direct sunlight. A level between zero and 20 ppm is recommended indoors. Maintaining calcium hardness at acceptable levels is especially important in a saltwater pool, because calcium deposits can clog up the chlorine cells in the generator. When this happens, the chlorine levels will fall, even though you maintain a good chemical balance in the pool. The chlorinator also works harder, and it will wear out that much sooner. If a test reveals the calcium hardness to be more than 400 ppm, it's time to do something. You could drain some water from the pool and replace it with fresh water, but if your water comes from a well, it's probably also hard. If that's the case, a better strategy is to add a flocculant to the water to precipitate the calcium compounds out of the water. Once you've vacuumed the sediment from the bottom of the pool, backwash the pool filter, and then remove the cells from the chlorinator and clean them with water or--if they are severely scaled--with a vinegar/water solution. Most chlorinators have a super-chlorinating setting, but using this setting won't add enough chlorine quickly enough to kill algae or clear severely clouded water, and it isn't a substitute for shocking the pool. To effectively shock the pool, you must quickly raise the free chlorine concentration to 10 ppm or more, and you do this the same way as you would in a conventional pool -- by adding chlorine. You can use calcium hypochlorite, sodium hypochlorite or chlorine tablets. Because they contain a stabilizer, chlorine tablets are a great option if the cyanuric acid concentration in your outdoor pool is too low. If the cyanuric acid concentration is already where it should be, then use pool chlorine, household bleach or a commercial shocking compound.